Step number one is to "rough cut" the wood into easily handled pieces. 48" works well for our Hoosier cabinets. One edge is then surfaced on the jointer. This gives us a true, straight edge on the board. 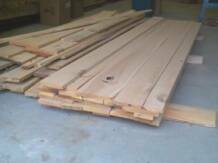 The boards are then cut into 2" and 3" widths for the Hoosier's stiles and rails. 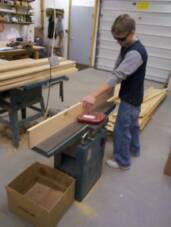 Each rip (a cut with the grain) is made 1/16" larger than needed so the board can again be run over the jointer leaving four smooth, parallel sides. 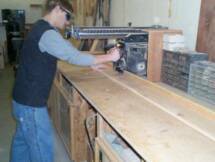 Each Hoosier Cabinet requires approximately 1,200 lineal inches of 2" wide boards and 250 lineal inches of 3" wide boards. Other boards are rough cut in preparation for gluing up the solid oak top, bottom, shelf, and interior center piece. Rough cutting boards in half. Surfacing an edge on the jointer.